Financial stress has a huge impact on your employees’ wellbeing. Between living expenses, loan payments, and activity fees for children, financial stress adds up. With all the bills to worry about, 65% 2 of Americans end up saving little or nothing, leaving them struggling in retirement. Securing a solid financial future is possible. 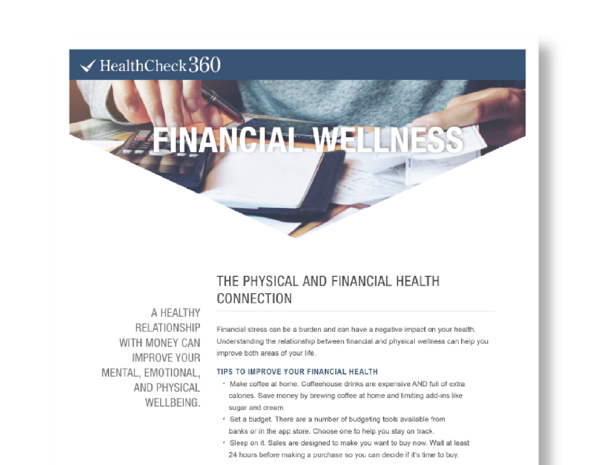 HealthCheck360 offers a financial well-being solution for your employees through the award winning MetLife Retirewise® program. This comprehensive financial and retirement education series supports and complements your benefit plan, and goes beyond planning for retirement. You don’t have to be a MetLife client in order to take advantage of this financial wellbeing program. No matter what age, background or career stage, your employees will get the information they need to take action and make smarter decisions. This is available to groups of 500 or more employees, and all at no cost to you and your employees. The program delivers objective information that covers a broad spectrum of financial and related topics from budgeting, and basic financial investment concepts to how to structure a retirement income stream. MetLife has an exclusive arrangement with Massachusetts Mutual Life Insurance Company financial professionals to deliver the program. Check out this free educational Financial Wellness poster you can share with your employees. *Minimum group size is 500 employees; all employees do not need to be at the same location. companies providing Retirewise through MetLife.